The rainbow-colored square is so iconic that it sometimes can stand in for the entire 1980s as an icon, the way that a yellow smiley face or a disco ball can for the 1970s or a peace sign for the 1960s: The Rubik's Cube. There were people who got really into them and could solve any cube in a minute flat, and people who worked with them for hours. 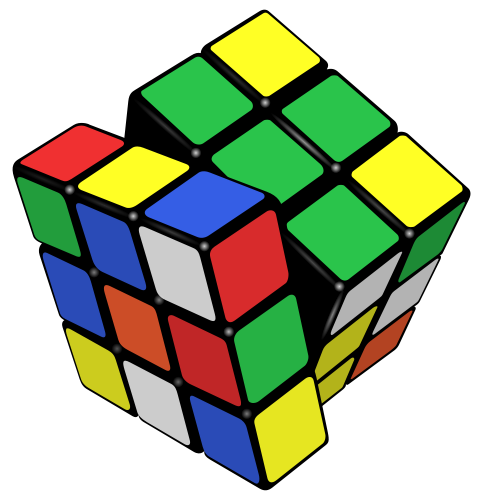 Most of us, though, had a brief moment when we were dedicated cubers, then either gave up and shoved them under the couch or started peeling the stickers off to fake it. The original cube is 30 this year. It set off a number of spinoff versions as they tried to keep the craze alive, but the only one I really remember is Rubik's Snake. Anyone ever try that? Oh, and who could forget the cartoon? (Yes, a cartoon) Rubik The Amazing Cube! Menudo sang its theme song, in what is perhaps the most perfect synergy of an uber-80s product and an uber-80s band.